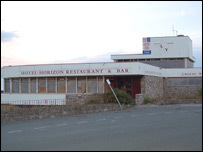 A landmark building known as Hotel 70 Degrees at Colwyn Bay may finally be demolished to make way for 56 new homes. Its name was a result of its unusual construction in 1972 when 70 degree angles were cut into everything from the carpets to the stairs. It was built in 1972 on a cliff top above the town looking out towards the sea, although it is now closed. Conwy Council will consider the housing plan later this year. "The place is an eyesore now, it is virtually derelict and has to come down," said Graham Roberts, president of Colwyn Bay Civic Society. Permission to pull the building down has already been granted, but the new housing plan for a mix of apartments and town houses has only just been presented to Conwy Council by Country and Metropolitan Homes. 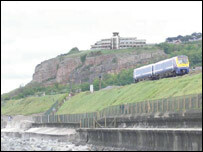 The company's planning manager John Beardsell said the site was "one of the most outstanding locations on the north Wales coast" which demanded "something special". "We have put everything into this project and have been helped by officers and councillors from Conwy Council along the way," Mr Beardsell added. Mr Roberts researched the history of the site and published his findings on the Colwyn Bay Civic Society website. He said: "The original plan was to build a small restaurant on the site because the main road passed it at the time, but the architect persuaded his client that the site merited a much grander design and the hotel was built. "It was named because of the angles used in its construction," said Mr Roberts. "It made for an unusual concept, but from the builder's point of view, proved a terrible waste of material. "The carpets had to be cut at 70 degrees, even the stairs are constructed at 70 degrees," he added.